As a property owner, you expect to feel secure in the safety and well-being of your property. However, property damage can strike without warning at any time. Whether it’s water damage, fire damage, or mold contamination the impact is severe and requires emergency restoration so you can get back to normal quickly. If you’re suffering from water damage or any other form of property damage, don’t wait to call 911 Restoration of Riverdale. We’ll take care of every aspect of your emergency restoration and deliver a Fresh Start you can count on. Water damage can occur in a variety of ways. It can come from a toilet overflow that seeps through layers of your home, to a leaky appliance hose connected to your dishwasher. Regardless of the source of water damage, the problem needs to be remedied promptly to prevent further damage. We strive to provide the best water restoration service possible for our customers. To help us accomplish that goal, we use nothing but the latest water extraction equipment and dryers to get your property to good as new. Plus, we use infrared cameras to identify wet spots that would be unnoticed otherwise to limit the potential for mold growth in the future. If you have noticed water damage in your property, call 911 Restoration of Riverdale to handle your water restoration. We have you covered from start to finish. That’s our Fresh Start guarantee. Low temperatures can cause problems for property owners by creating the perfect environment for a frozen pipe. With a frozen pipe, the water is unable to flow as it should, which builds up pressure over time. If left unchecked, this can result in a burst pipe leading to problems like a flooded basement immediately. Your first step, if possible, is to get the water turned off. Once that is addressed, call 911 Restoration immediately. We’ll be there within 45 minutes to handle all aspects of your flood cleanup. By using the latest water extraction equipment and dryers, we not only get your property back to normal but also proactively prevent the need for possible mold removal. 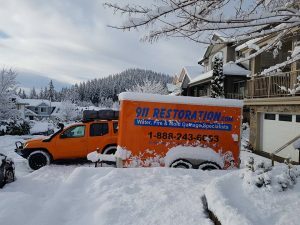 If you’re suffering from the effects of a frozen pipe call 911 Restoration to assist you. With us, you can count on all water damage concerns to be handled promptly and efficiently. Get your Fresh Start today. A sewage backup is a serious matter for a property owner. Overflows and burst sewer pipes can result in the spread of raw sewage throughout your property and grounds if not contained quickly enough. Due to the raw waste involved, it is considered a class 3 hazardous material that should never be handled directly. Our sewage cleanup techs use the strongest industrial grade detergents and cleaners to decontaminate the affected area while staying protected by wearing hazmat suits. After decontamination, we start with the water extraction, drying, and necessary repairs so that you can go back to normal as quickly as possible. We take your health seriously, which is why we don’t cut any corners in our sewage cleanup process. To help deliver a superior service, we walk with you through the whole process so you’re never unaware of exactly what is happening. If you notice a toilet overflow or other reason for a sewage cleanup, call 911 Restoration immediately. We’ll be there day or night to handle your sewage cleanup. You can count on a Fresh Start when you call us today! Disasters come in many different forms that range from severe rain and storms to hurricanes, tornadoes, and earthquakes. However, no matter what variety of disaster befalls your dwelling, the professionals at 911 Restoration Riverdale will be at your side to take care of it for you. Zack and his techs make sure to always put the needs of the customer as a top priority on every job that they do. If your home or business is already undergoing the aftereffects of a disaster, then don’t wait another minute to contact the disaster restoration specialists at 911 Restoration of Riverdale today! Determining the source of mold contamination takes know-how and expertise while visually inspecting the property for tell-tale signs like crumbling drywall or a pungent stale odor. With all the training, tools, and talent in the business, Zack and his mold removal experts can eliminate the effects of mold in any sized home or business and will do so with minimum impact to living or doing business. “Mold is serious stuff, and many people can experience health problems as a result of continued exposure to it, so we set up all of the proper vapor barriers, and containment procedures needed to prevent airborne mold spores from proliferating,” Zack explains. 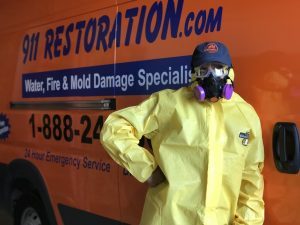 If you suspect mold or notice an infestation, don’t hesitate to contact the mold removal specialists at 911 Restoration for your mold removal. We’ll be there soon to deliver a Fresh Start for your property. Fire and smoke damage is one of the more destructive forms of disaster restoration work that can affect property owners. Smoke from a fire event can travel throughout an entire home using the ventilation system to navigate, and this can mean that while a fire breaks out in the kitchen, all rooms might be affected. In addition to smoke issues and odor contamination, fire and smoke damage also tends to bring accompanying water damage as well. This happens because when the fire department puts out a blaze, they tend to do so with large volumes of water that then sits inside the home until the water is professionally extracted and dried out. If you’re already going through a fire and smoke damage crisis and you want the best in the business to take care of it for you, then contact 911 Restoration of Riverdale. We’ll handle your fire damage restoration from start to finish. Get your Fresh Start today!